How much does it cost to travel to Rosario? How much money will you need in Rosario? AR$1,947 ($47) is the average daily price for traveling in Rosario. The average price of food for one day is AR$510 ($12). The average price of a hotel for a couple is AR$2,165 ($52). Additional pricing is in the table below. These average travel prices have been collected from other travelers to help you plan your own travel budget. Rosario is the third largest city in Argentina. Located at the Parana river and known for its rich architectural heritage and beautiful riverside scenery, Rosario is the birthplace of the Argentinian flag as well as two of the nation's most famous icons, Che Guevara and Lionel Messi. Rosario is still an important river port but has done a great job of regenerating its center, which now has a vibrant cultural and night life. The abandoned buildings of the long riverbank have been converted into galleries, restaurants, skateparks and river beaches, which buzz with life in summer. Dynamic and confident without being showy, culturally rich and the best urban location to cool off in the boiling summers, Rosario is easily overlooked but not to be missed. The National Flag Monument is probably Rosario's most recognizable landmark. It was built as a memorial to the creator of the Argentinian flag, Manuel Belgrano, who first revealed the flag on an island in the Parana river, just off the shores of Rosario, in 1812, and underneath the monument lies his tomb. The memorial is a stunning spot to grasp panoramic views of the city. The tower section of the monument is open on Monday from 14h to 18h30 and from Tuesday to Sunday from 9h to 18h30, to visitors who wish to climb to the top and look out over Rosario. Another popular sight in Rosario is its Catedral Basilica Santuario. Rosario's central cathedral dates from the late 19th century, and can seem quite plain from the outside but the interior is ornately decorated, with carved marble columns, a delicately painted sanctuary, and stained-glass windows, many of which portray the history of the city. It is located in Plaza 25 de Mayo, which is considered to be the oldest part of the city and consequently is home to a number of other historic buildings, including the municipal building and central post office. You will also find that many tourists and mostly fans of Ernesto 'Che' Guevara gather in front of the revolutionary's birthplace, an attractive neoclassical apartment building in the central district of the city  although he only lived there for a short time. It is owned privately, so visitors cannot enter. Finally, Rosario is home to a number of parks where visitors can take some time out to go for a walk of just relax. Parque Independencia is the largest, with a lake, fountains, various gardens, follies, and food vendors. Visitors can rent a paddle boat to take out onto the lake, a perfect activity for a sunny afternoon. Also within the park are the football stadium and history museum, as well as a fun children's play area (Jardin de los Ninos). Parque de Espana is by the river, which makes for a pleasant walk, as does Parque Urquiza. 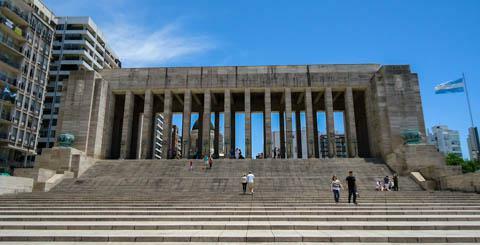 Located right in the middle of the Parque Independencia is Rosario's main history museum. It is home to a number of excellent exhibits, ranging from indigenous artifacts to post-colonial religious displays, as well as an intriguing display of mate-related items. The museum is open from Tuesday to Friday from 9h to 18h and on weekends from 14h to 19h. Rosario's Museum of Contemporary Art, also known as MACRO, is housed in a strange looking building right by the riverside, which used to be a grain silo and is now home to ten floors of modern artwork, mostly by young local artists. Do not forget to take a look at the top floor of the building, which provides great views of the river and the city. Finally, Rosario's Museum of Fine Art is considered the best fine art museum in Argentina, outside of Buenos Aires. It houses around 4,000 works of art from both Argentina and Europe, mainly dating from the 19th and 20th centuries up until 1930. Both museums are closed on Tuesday and can be visited from 14h to 20h during the rest of the week. While Rosario's museums are fascinating, most people come to the northern part of Rosario for its beach zone including Catalunya and La Florida Beaches. You can expect these popular spots to be very animated from October to May, as they are both home to plenty of restaurants (many serving freshly caught fish) and other amenities. The river may be brown, but from silt rather than pollution, and it is a safe area in which to swim. Some islands in the Parana river, just off the shoreline of Rosario, have been turned into parks. Isla Espinillo is the most popular, as it has various restaurants, bars and spaces to relax, and offers a few water sports activities such as jet skiing and windsurfing. You can take a ferry across to the islands, where it is also possible to book boat tours and other activities.Two great ways to explore Rosario and the surrounding area are either cycling to get around the city quickly and see all the sights, or kayaking on the Parana river, a great way to escape the city for a while and see some local wildlife. Kayaks and bikes can be rented either individually or as part of a group tour with a guide who can provide some local insight. It's all about the river fish in Rosario. Surubi, dorado, pacú and boga served with a delicious salad and masses of bread and potatoes are one of their favorites. But don't worry, if fish is not your first choice, there are plenty of other tasty foods in Rosario to tempt your taste buds, including the legendary Argentinian steak accompanied by a nice glass of Argento Malbec, or Argento Bonarda. There are daily flights from Buenos Aires Aeroparque Airport and Ezeiza Airport to Rosario's airport, which will bring you in only 50 minutes from one city to the other. Rosario also has two railway stations, Estacion Rosario Sur, which is located in the southern suburbs and the terminus Estacion Rosario Norte, which is closer to downtown. Trenes Argentinos runs a daily train from Buenos Aires. Additionally, twice a week there are trains from Cordoba (via Villa Maria) and San Miguel de Tucumán (via Santiago del Estero). These trains are very cheap, but they are slow and scarce so you must reserve your ticket well in advance. Locals either take their car or a rented car, the bus or a private taxi service (remisse). Two freeways (autopistas) connect Rosario with Buenos Aires, Santa Fe, and Cordoba. The most convenient way of travelling in Argentina remains the bus (4h journey from Buenos Aires). There are many buses departing daily from the Rosario bus station to almost every city in the country. It is also possible to travel by bus to southern Brazil, Chile, Peru, Bolivia and Uruguay.